Read the entire press release on Business Wire. Looks like a great addition to the park. The only concern I have, is the 450 people per hour. I can imagine that the line for this thing is going to be crazy long. Awesome! Exactly what I hoped they'd get after SDC got theirs. I really love the plan Dollywood had in place. They haven't missed a step in the attractions they've put in since Thunderhead. I noticed that they're trying out a week of being open 10am to 10pm this week. I hope they do that more often. Looks like they're trying to become more of a resort destination in the same way the PR folks at Carowinds said they were (staying open later). Now, when are they going to build that hotel? A nice addition Sure the Single arm will be easily themed. LC has 2 arms and rarely uses both arms. So this should work out sell. The promo image says family ride but the height requirement will keep a good chunk of the family in the side lines. When CP built their giant swing I wasn't impressed, until I rode it. Now I'm hooked. For something thats so simple, the rides gives a good thrill. To be honest, I love the Screamin' Swings, but I find I don't like the smaller models quite as much. I am a huge fan of Skyhawk, but Swing Shot at Kennywood isn't as big of a thrill to me. There is a noticeable difference in the amount of airtime you get. That's just my opinion though. I will say that I really like the theming that the Barnstormer looks to have. Good choice, obviously, as the experience at SDC will attest. I'm more amused about this being the 2nd ride name obviously lifted from the defunct Opryland. The Barnstormer was the name used by Opryland for their Intamin Air Race ride (same as Six Flags over Georgia's old "Great Air Race"). The rides were famous for nothing other than the SFoG version mishapped in the early days of CNN, which allowed them to run full day coverage of stranded riders. Dollywood also aped the name of Opryland's rapids raft ride (Grizzly River Rampage) when they named their's Smoky Mountain River Rampage. Given that Dollywood is the logical successor to Opryland (same target market, and same emphasis on shows/entertainment over rides, per se), it's smart business. i just didn't expect an exact lift of the old Barnstormer name. Single Arm? It clearly states there will be two arms. 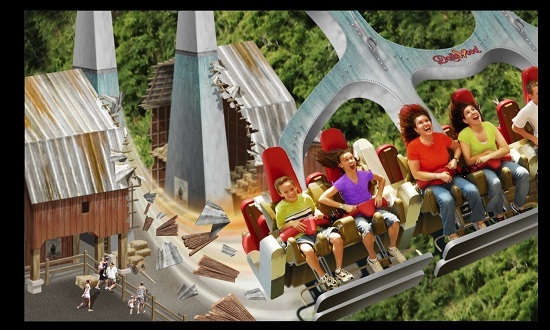 I imagine they will be eight across seating, back-to back, on each of the two arms for a total 32 riders, just like the one at sister-park SDC. Looks to have more range of motion than Skyhawk! That might compensate for the height. Skyhawk has slightly more rotation, but it's not a difference most would notice. The height (81ft vs 125ft) is where the difference becomes apparent. I've only been on the pair at CP and Valleyfair, so I can't comment on smaller models, but I really dig these rides. Now that they run more reliably, it's good to see S&S with another winner. The smaller ones (as one might expect with less mass to move) get going quicker. There is a single arm 4 seat model (upcharge) at Mt. Olympus that's a lot of fun. IIRC it was $10 for the first ride and $5 for each reride. Though I'm not a fan of upcharge, I did it and enjoyed it. It was a different experience than the slower starting/stopping Skyhawk. I did the upcharge at Knott's in 2005 and loved it. I think they're a ton of fun, and if this one is themed like the one in SDC, I think they'll have another hit on their hands. Where in the park are they going to put this at? In the Dreamland Forest area. Best new addition that the park could have made, in my opinion. I doubt that the line will get "crazy long", because a lot of the people who go there don't even ride rides. Is this the first S&S Screamin' Swings with real theming?